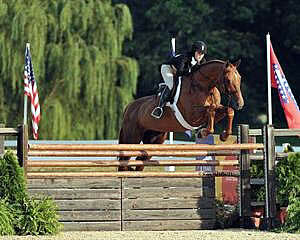 Lexington, Ky. – Voting is now open for the coveted 2013 USEF Equestrian of the Year award. Following decades of tradition, the winner will again be announced when the horse world meets at the United States Equestrian Federation’s annual Pegasus Awards gala. This year’s gala will be held on Friday, January 10, 2014 at the Hyatt Regency Lexington in Lexington, Ky., and broadcast live on the USEFNetwork presented by Smartpak. In 2013, Beezie Madden cemented her status among the sport’s elite as she won at nearly every turn. She began her record-setting campaign at the FTI Consulting Winter Equestrian Festival winning the $125,000 FEI W-Cup Grand Prix CSI3* presented by Spy Coast Farm before aiding in the winning U.S. effort in the $75,000 Furusiyya FEI Nations Cup presented by G&C Farm. Also during CSIO Wellington, she produced a second-place effort in the feature Grand Prix, the $150,000 CSIO4* Grand Prix presented by Wellington Equestrian Realty. In April, Madden traveled to Gothenburg, Sweden, to claim the one title that had eluded her in her illustrious career, the Rolex/FEI World Cup Final crown. She kicked off the week with a win in the Speed Leg before jumping three more consistent rounds with Simon to force a jump-off with the reigning Olympic champion, where a clear effort saw her claim victory. She continued to dominate in Europe producing an impressive two double clears in Furusiyya FEI Nations Cup competitions and a Longines Global Champion Tours Grand Prix of Chantilly victory over the summer with Cortes ‘C.’ Madden then helped the U.S. to a win in the Consolation Round of the Furusiyya FEI Nations Cup Final in Barcelona. As a testament to her 2013 success, Madden spent three months as the second ranked rider in the world on the Longines/FEI Rankings. This is the third time Madden has been awarded the William C. Steinkraus Trophy. Chester Weber added to his legacy in 2013 with a campaign that saw him win at home and abroad against many of the best Four-in-Hand drivers in the world. He got off to a hot start with a win in the Four-in-Hand division at Little Everglades CDE in February. The following month, Weber and his team secured another victory, this time on his home turf at the Live Oak International CDE with an impressive performance. He then traveled to Europe, where he once again took the world by storm. At the Saumur CAI-A4, he topped a world-class field with a masterful effort over the three phases of competition. To finish his summer campaign, Weber was again victorious in France winning the Caen CAI-A4, which served as the Test Event for the 2014 Alltech FEI World Equestrian Games. Also while in Europe, the talented driver produced third-place efforts at CHIO Aachen and CAI Beekbergen. Weber finished out the season by earning a record 10th USEF Four-in-Hand National Championship at the Kentucky Classic CDE. Always regarded for his skill on the first day, he proved his proficiency in the dressage by going undefeated in the phase throughout the year. Additionally, Weber used his expertise to help other drivers as he served Chef d’Equipe guiding the U.S. team to a fourth-place finish at the FEI World Driving Championships for Pairs. This is the third time Weber has been awarded the Becky Grand Hart Trophy. Chris and Sonya Bickford have a long history in the sport of Carriage Pleasure Driving, having bred, trained, and driven many National Champions. Both Chris and Sonya developed a passion for equestrian competition in their childhoods and have competed across numerous divisions and disciplines, but it is in Carriage Pleasure Driving that their passion lies. The Bickfords run a truly family business, as they produced their champions themselves, with husband and wife always supporting one another. In 2013, the Bickfords once again enjoyed an extremely successful show season that has often seen them heading the field. In 2013, Chris earned two Carriage Pleasure Driving National Championships in the Working and Gambler’s Choice divisions as well as garnering four National Top 10s in Turnout, Pick Your Route, Reinmanship, and Timed Obstacles at the 2013 U.S. Arabian & Half Arabian Sport Horse National Championship Show. Additionally, he drove the second-ranked USEF National High Point for Carriage Pleasure Driving Single Horse. Sonya had a wildly successful season in her own right as well, driving to the Arabian & Half-Arabian Sport Horse National Champion Carriage Pleasure Driving Reinmanship and Arabian & Half-Arabian Sport Horse Reserve National Champion Carriage Pleasure Driving Working titles. She is actively competing with the leading USEF National Champion Carriage Pleasure Driving Single and Grand National Champion Carriage Pleasure Driving horse, trained by Chris. This is the first time Chris and Sonya Bickford have been awarded the Bill Robinson Trophy. Liza Boyd has long been regarded as one of the top hunter professionals in the industry, and in 2013 she added to her legacy with a season of which many could only dream. Boyd paired with multiple horses over the last 12 months to earn top prizes at many of the United States’ most prestigious competitions in coveted classes. She got the season off to a strong start at the FTI Consulting Winter Equestrian Festival claiming Champion and Reserve Champion honors in the Gold Coast High Performance Working Hunter division in February. In the fall, she showed her skill and adaptability by winning the WCHR Professional Finals, where riders competed with donated horses over the first two rounds. However, August would host Boyd’s biggest career victory when she bested a star-studded field in the 2013 USHJA International Hunter Derby Championships with longtime partner Brunello. This was the pair’s fifth International Hunter Derby win in as many months after topping fields in the Camden Spring International Hunter Derby, the Atlanta Spring International Hunter Derby, the Atlanta Summer International Hunter Derby, and the BRCHS International Hunter Derby. Boyd and Brunello kicked off their championship season with strong second-place finishes in the Jacksonville Finale International Hunter Derby before placing second in the WCHR Palm Beach Hunter Spectacular. This is the first year Boyd has been awarded the Emerson Burr Trophy. The C. J. “June” Cronan Trophy is presented to those exceling in under saddle show breeds. Jim Stachowski has managed and operated Stachowski Farms for over 30 years and helped the business expand beyond Ohio and into California and Arizona. Stachowski is not only highly regarded for his success in the show ring, but also for his innate ability to mentor young trainers as well as pair clients with top horses, helping many of those that have come through his program to earn national honors. In 2013, Stachowski’s success in the show ring speaks for itself, as the talented and diverse trainer and rider earned countless top prizes throughout the year in the American Saddlebred and Arabian disciplines. At the World’s Grand Championship Show at the Kentucky State Fair, he garnered World Championship titles in the Three-Year Old Three-Gaited and Three-Year Old Park Pleasure Futurity divisions, as well as a World Reserve Grand Champion Fine Harness Stallion/Gelding Stake title. Stachowski’s storied foothold in the Arabian show arena was punctuated with top honors in the Half-Arabian English Pleasure Futurity and Country English Pleasure Championships and Reserve National Championships in the English Pleasure and the Half-Arabian English Pleasure Junior Horse classes at the 2013 U.S. Arabian & Half Arabian National Championship Show. 2013 is the second time Stachowski has been awarded the C. J. “June” Cronan Trophy. Rick Gervasio has been riding horses almost as long as he has been walking. A second-generation horseman, he has shown National Champions in five different breeds, showing his versatility is as broad as the abilities of the horses he has trained. World renown as a trainer of winning Quarter Horses, Paint, and Appaloosa western pleasure horses, Gervasio accepted his first Morgan for training in 2008. The talented competitor and trainer quickly began to acquire the necessary knowledge to take Morgan horses to the top. Gervasio has competed at the Morgan Grand National in Oklahoma City, Okla., for the last three years, garnering a plethora of top finishes. In 2011, 2012, and 2013 he earned multiple World and Reserve World Championships, as well as Grand National Championships in the ever competitive Western Pleasure division. His versatility extends beyond the western pleasure division, as he continually earns top honors in Trail and Western Dressage is a true testament to his skill and versatility. In five short years, Gervasio has established himself as one of the top western trainers in the Morgan breed. This is the first time Gervasio has been awarded the Barbara Worth Oakford Trophy. Notably a true horseman, Bruce Griffin has won numerous national awards in a myriad of breeds, but he is a shining star when it comes to Sport Horse In-Hand and Halter. 2013 proved to be nothing less than a stellar year for Griffin in these divisions. At the IFSHA Grand National and World Championship Show, Griffin earned 10 National and World Titles, eight Reserve National and World Titles, and four Top Five awards in halter and sport horse in-hand classes. Additionally this year, he won the coveted Grand Championship at the prestigious Dressage at Devon Horse Show. 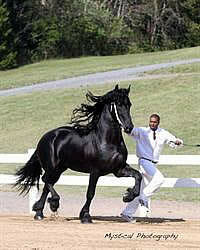 Adding to his accolades in 2013, Griffin has trained and shown the current first-ranked USEF Friesian Halter Horse. Regardless of his busy schedule Griffin continues to provide working student opportunities for young handlers/riders to further their knowledge in the industry. This year, he offered many young students the opportunity to show at the IFSHA Nationals Championships where they were very successful and earned numerous National and World Titles in Halter and Sport Horse In-Hand. This is the second consecutive year Griffin has been awarded the Norman K. Dunn Trophy. Martha Rattner has built a career based on professionalism, integrity, showmanship, and horsemanship, all attributes imparted on her by her mentor Professor Norm Dunn. In addition to her accomplishments in the Arabian and Half-Arabian and National Show Horse divisions, Rattner has been in the spotlight in the Sport Horse In-Hand division since 2009, earning over 850 achievement points with five different horses she trained herself, with three of those horses having been awarded their Legion of Masters. An Arabian Horse Association Hall of Fame member, she has a long list of career accomplishments which include multiple National titles in the Ladies Side Saddle, English, and Pleasure Driving divisions. More recently Rattner has been a fixture in the winner’s circle of Arabian Sport Horse, Dressage, and English Trail division with an outstanding year in 2013 which saw her win 23 Regional Championships, nine National Top Tens, and a Reserve National Championship. 2013 is the first year that Rattner has been awarded the Vaughn Smith Trophy. One of these eight award-winners will be honored as the overall 2013 USEF Equestrian of the Year. Now, it is up to you – USEF members and the USEF Board of Directors – to decide who will receive the top tribute for 2013. Simply visit https://www.usef.org/_IFrames/eoty/Default.aspx and type in your USEF membership number to access the voting portal. Voting will end at Midnight [ET] on Monday, December 30, 2013.